If you like poker but have a limited amount of time to play or would like the action to be at a faster pace, you may think that there is a niche in the market that is waiting to be filled. While some poker players like to take their time over their hands and attempt to psyche out their opponents, other poker players are all about the wham, bam, thank you mam approach. Both of these options are good options and the one you prefer will probably depend a lot on your personality and nature. The thing is though, if you have a combination of fast poker players and slow poker players, the slow poker players have the chance to drag the fast ones down to their level. This gives the slower players an advantage and the fast nature poker players may feel at a disadvantage. This is where poker games can be won or lost but this is why it is great news that there is a new style of poker game that suits the needs of fast playing poker players perfectly. One of the things about online poker sites is that they listen to the demands and requests of their players. This makes perfect sense because if they don’t listen to these demands, someone else will and one poker site will clean up with all of the players. There has been a demand for fast poker action from many online poker players and the introduction of Fast Forward Poker gives players what they want. There is nothing overly different about Fast Forward Poker. You won’t need to learn new rules, there are not new ways of betting and you certainly don’t need any special equipment or knowledge to take part in the game. 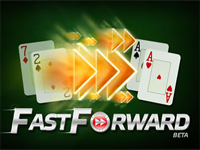 Fast Forward Poker is your standard poker game, except it is played a lot faster. That is all there is to it, it is your normal poker game with normal rules but the play develops at a much faster rate. If this sounds like something that you have been waiting for, Fast Forward Poker is definitely going to be something that will appeal to you. The exciting thing about Fast Forward poker is the fact that the action is all about you in these exciting cash games. If you take a look at your cards and decide that you don’t like them and would prefer not to play them, you can do just that. It is possible to fast forward your way through to a different poker hand with one click of a mouse. You don’t need to be a maths genius to understand that if you play more poker hands, you will see more action, you will have an increased opportunity to be a winner and hopefully you will have more fun when it comes to playing poker! There is no need for you to wait for the action to come around to you, if you don’t feel like playing a hand, you can elect to fast forward and you will be placed into a new round and you will receive a new hand. You don’t have to worry about how the other players at the table will respond because they will not be aware of your actions until you have gone. This is the poker option for players that like to stay in control. As soon as you fold on a poker hand, you will be taken INSTANTLY to a separate poker table where there will be new opponents to take on and there will be new hold cards on the table. You don’t need to wait for the poker action to come around to you. If you take a look at the hold cards available and think that they are not suitable for you, make the decision to move on and you will be whipping your way to another poker table quickly. The Fast Forward poker option is available at No Limit Hold ‘Em tables for cash and the stakes start from as little as $0.02/$0.04. You don’t need to be a high roller to get the benefit of this sort of poker play. It is not a hard task to find the Fast Forward option on your favourite poker site as it is one of the most popular poker activities available at the moment. You will find the Fast Forward poker option in the majority of client lobby’s. There is even the chance to experience the Fast Forward style of poker in a heads-up environment, which should offer the fastest and most exciting style of poker play you can find in the online poker community. The Fast Forward button is situated close to where you would expect to find the fold button on your screen so there is nothing out of the ordinary in using this method. It is also possible to sit at a number of tables at one time with the multi-table option that is available with Fast Forward poker. If you want to add more speed and intensity to the way that you play poker, this is definitely going to be the playing option that works best for you. You also don’t need to worry about finding yourself coming up against yourself in the multi-table environment. The Fast Forward poker system utilises strong algorithms which will ensure that you never find yourself sitting in two positions at one poker table! Mind you, the poker players that always manage to defeat themselves may find that this would be a help to them, allowing them to win a poker hand every so often! Poker players that prefer to have an element of pace in their game will find a lot to enjoy about the emergence of Fast Forward poker. If you find yourself being frustrated by poor hands and slow play, take control of your poker activity and start playing hands on fast forward.